Philip I (23 May 1052 – 29 July 1108), called the Amorous, was King of the Franks from 1060 to 1108, the fourth from the House of Capet. His reign, like that of most of the early Capetians, was extraordinarily long for the time. The monarchy began a modest recovery from the low it reached in the reign of his father and he added to the royal demesne the Vexin and Bourges. Philip was born 23 May 1052 at Champagne-et-Fontaine, the son of Henry I and his wife Anne of Kiev. Unusually for the time in Western Europe, his name was of Greek origin, being bestowed upon him by his mother. Although he was crowned king at the age of seven, until age fourteen (1066) his mother acted as regent, the first queen of France ever to do so. Baldwin V of Flanders also acted as co-regent. Following the death of Baldwin VI of Flanders, Robert the Frisian seized Flanders. Baldwin's wife, Richilda requested aid from Philip, who was defeated by Robert at the battle of Cassel in 1071. Philip first married Bertha in 1072. Although the marriage produced the necessary heir, Philip fell in love with Bertrade de Montfort, the wife of Fulk IV, Count of Anjou. He repudiated Bertha (claiming she was too fat) and married Bertrade on 15 May 1092. In 1094, he was excommunicated by Hugh of Die, for the first time; after a long silence, Pope Urban II repeated the excommunication at the Council of Clermont in November 1095. Several times the ban was lifted as Philip promised to part with Bertrade, but he always returned to her, but in 1104 Philip made a public penance and must have kept his involvement with Bertrade discreet. In France, the king was opposed by Bishop Ivo of Chartres, a famous jurist. Philip appointed Alberic first Constable of France in 1060. A great part of his reign, like his father's, was spent putting down revolts by his power-hungry vassals. 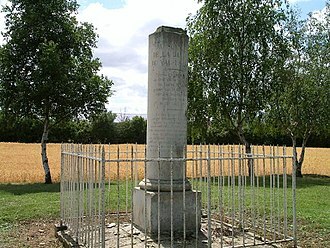 In 1077, he made peace with William the Conqueror, who gave up attempting the conquest of Brittany. In 1082, Philip I expanded his demesne with the annexation of the Vexin, in reprisal against Robert Curthose's attack on William's heir, William Rufus. Then in 1100, he took control of Bourges. It was at the aforementioned Council of Clermont that the First Crusade was launched. Philip at first did not personally support it because of his conflict with Urban II. Philip's brother Hugh of Vermandois, however, was a major participant. … King Philip daily grew feebler. For after he had abducted the Countess of Anjou, he could achieve nothing worthy of the royal dignity; consumed by desire for the lady he had seized, he gave himself up entirely to the satisfaction of his passion. So he lost interest in the affairs of state and, relaxing too much, took no care for his body, well-made and handsome though it was. The only thing that maintained the strength of the state was the fear and love felt for his son and successor. When he was almost sixty, he ceased to be king, breathing his last breath at the castle of Melun-sur-Seine, in the presence of the [future king] Louis... They carried the body in a great procession to the noble monastery of St-Benoît-sur-Loire, where King Philip wished to be buried; there are those who say they heard from his own mouth that he deliberately chose not to be buried among his royal ancestors in the church of St. Denis because he had not treated that church as well as they had, and because among those of so many noble kings, his own tomb would not have counted for much. Constance (1078 – 14 September 1126), married Hugh I of Champagne before 1097 and then, after her divorce, to Bohemund I of Antioch in 1106. Louis VI of France (1 December 1081 – 1 August 1137). Henry (1083 – died young). Cecile (1097 – 1145), married Tancred, Prince of Galilee and then, after his death, to Pons of Tripoli. ^ McDougall 2017, p. 154. ^ a b c Hallam 1980, p. 50-51. ^ Bradbury 2007, p. 111. ^ Strickland 2016, p. 342. ^ Bradbury 2007, p. 114. ^ a b Bradbury 2007, p. 119. ^ Somerville 2011, p. 118. ^ d'Avray 2014, p. 47. ^ Rolker 2009, p. 16. ^ Petit-Dutaillis 1936, p. 81. ^ Shepherd 2003, p. 13. ^ Brown 1990, p. 807. ^ Paul 2012, p. 38. ^ a b Huscroft 2016, p. xi. ^ Power 2004, p. 85.
d'Avray, David, ed. (2014). "Philip I of France and Bertrade". Dissolving Royal Marriages: A Documentary History, 860–1600. Cambridge University Press. Brown, Elizabeth A. R. (1990). "Authority, the Family, and the Dead in Late Medieval France". French Historical Studies. 16 (4 Autumn). Hallam, Elizabeth (1980). Capetian France: 987-1328. Longman Group Ltd.
Huscroft, Richard (2016). Tales from the Long Twelfth Century: The Rise and Fall of the Angevin Empire. Yale University Press. Paul, Nicholas L. (2012). To Follow in Their Footsteps: The Crusades and Family Memory in the High Middle Ages. Cornell University Press. Petit-Dutaillis, C. (1936). The Feudal Monarchy in France and England:From the 10th to the 13th Century. Translated by Hunt, E.D. Routledge. Power, Daniel (2004). The Norman Frontier in the Twelfth and Early Thirteenth Centuries. Cambridge University Press. Rolker, Christof (2009). Canon Law and the Letters of Ivo of Chartres. Cambridge University Press. Shepherd, Jonathan (2003). "The 'muddy-road' of Odo Arpin from Bourges to La Charitie-sur-Loire". In Edbury, Peter; Phillips, Jonathan. The Experience of Crusading. Vol. 1. Cambridge University Press. Somerville, Robert (2011). Pope Urban II's Council of Piacenza. Oxford University Press. Strickland, Matthew (2016). Henry the Young King, 1155-1183. Yale University Press. Constance of France was the daughter of King Philip I of France and Bertha of Holland. She was a member of the House of Capet and was Countess of Troyes from her first marriage and she was regent during the minority of her son. Her mother was repudiated by her father for Bertrade de Montfort and it caused the displeasure of the church and an interdict was placed on France several times as a result. Constance was the eldest of five children and was the daughter of her father from his first marriage. 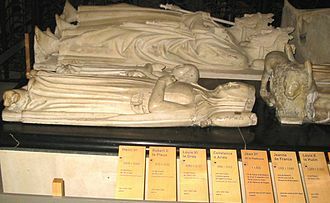 Constances brother was Louis VI of France, between 1093 and 1095, Phillip I arranged for his daughter, Constance, to marry Hugh, Count of Troyes and Champagne. Philip hoped to influence Hughs family, the powerful House of Blois, but the union between Constance and Hugh was too late to achieve the desired result. Hughs half-brother, Stephen II, Count of Blois, holder of most counties of the House of Blois was married, Stephen had married Adela of Normandy, daughter of William I of England, and their marriage had produced children. After ten years and without any surviving issue, Constance demanded an annulment of their marriage, Constance obtained a divorce at Soissons on 25 December 1104, under grounds of consanguinity. Constance went to the court of Adela, wife of Stephen and she was acting as regent since Stephen was killed in the Holy Land. Adela was well educated and all seemed to be well at the Court and it appeared that Adela used all her power to help Constance get a divorce from Hugh, who left to fight in the Holy Land. At the same time, Bohemond I of Antioch was just released by the Turks and he returned to Europe to obtain relief for the Crusaders in the Holy Land. The regency of the Principality of Antioch was assured by Bohemonds nephew Tancred and he impressed audiences across France with gifts of relics from the Holy Land and tales of heroism while fighting the Saracens, gathering a large army in the process. Henry I of England famously prevented him landing on English shores. His new-found status won him the hand of Constance, so great was the reputation for valour of the French kingdom and of the Lord Louis that even the Saracens were terrified by the prospect of that marriage. 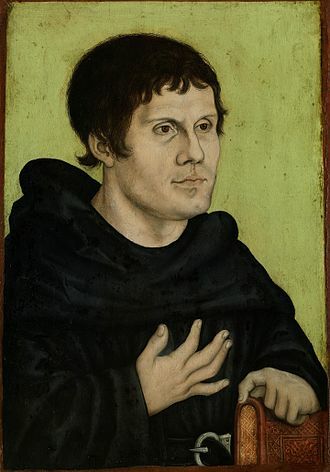 Suger was a French abbot and historian. He was one of the earliest patrons of Gothic architecture, and is credited with popularizing the style. Several times in his writings he suggests that his was a humble background, in 1091, at the age of ten, Suger was given as an oblate to the abbey of St. Denis, where he began his education. He trained at the priory of Saint-Denis de lEstrée, and there first met the future king Louis VI of France, from 1104 to 1106, Suger attended another school, perhaps that attached to the abbey of Saint-Benoît-sur-Loire. In 1106 he became secretary to the abbot of Saint-Denis, in the following year he became provost of Berneval in Normandy, and in 1109 of Toury. In 1118, Louis VI sent Suger to the court of Pope Gelasius II at Maguelonne, on his return from Maguelonne, Suger became abbot of St-Denis. Until 1127, he occupied himself at court mainly with the affairs of the kingdom, while during the following decade he devoted himself to the reorganization. He bitterly opposed the divorce, having himself advised the marriage. Although he disapproved of the Second Crusade, he himself, at the time of his death, had started preaching a new crusade, Suger served as the friend and counsellor both of Louis VI and Louis VII. He urged the king to destroy the bandits, was responsible for the royal tactics in dealing with the communal movements. He left his abbey, which possessed considerable property and embellished by the construction of a new built in the nascent Gothic style. Suger wrote extensively on the construction of the abbey in Liber de Rebus in Administratione sua Gestis, Libellus Alter de Consecratione Ecclesiae Sancti Dionysii, similarly the assumption by 19th century French authors that Suger was the designer of St Denis has been almost entirely discounted by more recent scholars. Instead he is seen as having been a bold and imaginative patron who encouraged the work of an innovative master mason. A chalice once owned by Suger is now in the collections of the National Gallery of Art in Washington, D. C. Abbot Suger and confidant of the French Kings, Louis VI and Louis VII, decided in about 1137 to rebuild the great Church of Saint-Denis, Suger began with the West front, reconstructing the original Carolingian façade with its single door. Anne of Kiev, Anna Yaroslavna, Anna of Rus called Agnes, was the queen consort of Henry I of France, and regent of France during the minority of her son, Philip I of France, from 1060 until 1065. Anne founded St. Vincent Abbey in Senlis, Anne was born between 1024 and 1032. Her parents were Yaroslav the Wise, Grand Prince of Kiev and Novgorod, there is not much information about her childhood, but she was evidently given a careful education, and could read and write, which was rare even among royal princesses at the time. In 1043–44, Anne was suggested to marry Henry III, Holy Roman Emperor, in 1049, the King of France sent an embassy to distant Kiev, which returned with Anne. But she did bring wealth to the match, including a jacinth which Suger mounted in the reliquary of St Denis and Henry I were married at the cathedral of Reims on 19 May 1051. Immediately after the ceremony, she was crowned queen of France and she became the first French queen to be crowned at Reims. Only one year after the marriage, Anne fulfilled her task by giving birth to an heir to the throne, Anne came to play an important personal role as queen of France. As queen, it was her role to act as the manager of the court and household, supervise the upbringing of the royal children. But she came to play a political role, Queen Anne could ride a horse, was knowledgeable in politics, and actively participated in governing France. She accompanied Henry I on his travels around France. Many French documents bear her signature, written in old Slavic language, Henry I respected Anna so much that his many decrees bear the inscription With the consent of my wife Anna and In the presence of Queen Anna. French historians point out there are no other cases in the French history. On 4 August 1060, Henry I died and was succeeded by her son Philip I, by that time eight years old. During his minority, Anne, as a member of the council, acted as Regent of France. She was the first queen of France to serve as regent, Anne was a literate woman, rare for the time, but there was some opposition to her as regent on the grounds that her mastery of French was less than fluent. 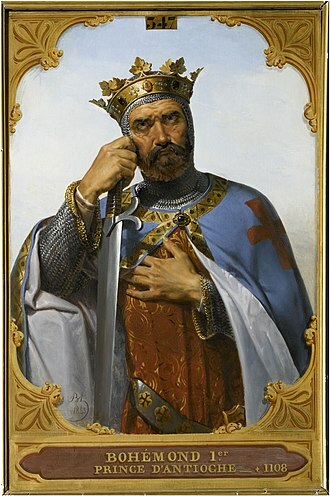 Hugh Capet was the first King of the Franks of the House of Capet from his election in 987 until his death. He succeeded the last Carolingian king, Louis V, the son of Hugh the Great, Duke of the Franks, and Hedwige of Saxony, daughter of the German king Henry the Fowler, Hugh was born in 941. Hugh Capet was born into a well-connected and powerful family with ties to the royal houses of France. Through his mother, Hugh was the nephew to Otto I, Holy Roman Emperor, Henry I, Duke of Bavaria, Bruno the Great, Archbishop of Cologne, and finally, Gerberga of Saxony, Queen of France. Gerberga was the wife of Louis IV, King of France and mother of Lothair of France and Charles and his paternal family, the Robertians, were powerful landowners in the Île-de-France. His grandfather had been King Robert I, King Odo was his granduncle and King Rudolph was his uncle by affinity. Hughs paternal grandmother was a descendant of Charlemagne, after the end of the ninth century, the descendants of Robert the Strong became indispensable in carrying out royal policies. As Carolingian power failed, the nobles of West Francia began to assert that the monarchy was elective, not hereditary. Robert I, Hugh the Greats father, was succeeded as King of the Franks by his son-in-law, when Rudolph died in 936, Hugh the Great had to decide whether he ought to claim the throne for himself. To block his rivals, Hugh the Great brought Louis dOutremer and this maneuver allowed Hugh to become the most powerful person in France in the first half of the tenth century. Once in power, Louis IV granted him the title of dux Francorum, Louis officially declared Hugh the second after us in all our kingdoms. Hugh gained power when Herbert II of Vermandois died in 943, Hugh the Great came to dominate a wide swath of central France, from Orléans and Senlis to Auxerre and Sens, while the king was rather confined to the area northeast of Paris. The realm in which Hugh grew up, and of which he would one day be king, Hughs predecessors did not call themselves kings of France, and that title was not used by his successors until the time of his descendant, Philip II. The House of Capet or the Direct Capetians, called the House of France, or simply the Capets, ruled the Kingdom of France from 987 to 1328. It was the most senior line of the Capetian dynasty – itself a derivative dynasty from the Robertians, historians in the 19th century came to apply the name Capetian to both the ruling house of France and to the wider-spread male-line descendants of Hugh Capet. It was not a contemporary practice and they were sometimes called the third race of kings, the Merovingians being the first, and the Carolingians being the second. The name is derived from the nickname of Hugh, the first Capetian King, the direct succession of French kings, father to son, from 987 to 1316, of thirteen generations in almost 330 years, was unparallelled in recorded history. The direct line of the House of Capet came to an end in 1328, with the death of Charles IV, the throne passed to the House of Valois, descended from a younger brother of Philip IV. He proceeded to make it hereditary in his family, by securing the election and coronation of his son, Robert II, the throne thus passed securely to Robert on his fathers death, who followed the same custom – as did many of his early successors. 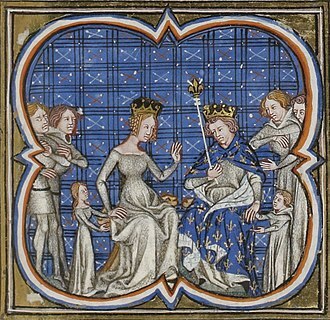 Louis VIII – the eldest son and heir of Philip Augustus – married Blanche of Castile, a granddaughter of Aliénor of Aquitaine and Henry II of England. In her name, he claimed the crown of England, invading at the invitation of the English Barons and these lands were added to the French crown, further empowering the Capetian family. Louis IX – Saint Louis – succeeded Louis VIII as a child, unable to rule for several years, the government of the realm was undertaken by his mother, at the death of Louis IX, France under the Capetians stood as the pre-eminent power in Western Europe. Unfortunately for the Capetians, the proved a failure. Philip IV had married Jeanne, the heiress of Navarre and Champagne, by this marriage, he added these domains to the French crown. More importantly to French history, he summoned the first Estates General – in 1302 – and in 1295 established the so-called Auld Alliance with the Scots and it was Philip IV who presided over the beginning of his Houses end. The first quarter of the century saw each of Philips sons reign in rapid succession, Louis X, Philip V, Louis – unwilling to release his wife and return to their marriage – needed to remarry. Bertrade de Montfort was a queen consort of France by marriage to Philip I of France. She was was the daughter of Simon I de Montfort and Agnes and her brother was Amaury de Montfort. According to the chronicler John of Marmoutier, The lecherous Fulk fell passionately in love with the sister of Amaury de Montfort, whom no good man ever praised save for her beauty. Bertrade and Fulk were married, and they became the parents of a son, Philip married her on 15 May 1092, despite the fact that they both had spouses living. He was so enamoured of Bertrade that he refused to leave her even when threatened with excommunication, pope Urban II did excommunicate him in 1095, and Philip was prevented from taking part in the First Crusade. Astonishingly, Bertrade persuaded Philip and Fulk to be friends, according to Orderic Vitalis, Bertrade was anxious that one of her sons succeed Philip, and sent a letter to King Henry I of England asking him to arrest her stepson Louis. Orderic claims she sought to kill Louis first through the arts of sorcery, whatever the truth of these allegations, Louis succeeded Philip in 1108. Bertha of Holland, known as Berthe or Bertha of Frisia and erroneously as Berta or Bertrada, was queen consort of the Franks from 1072 until 1092, as the first wife of King Philip I. Berthas marriage to the king in 1072 was a result of negotiations between him and her stepfather, Count Robert the Frisian of Flanders. After nine years of childlessness, the couple had three children, including Philips successor, Louis the Fat. Philip, grew tired of his wife by 1090 and that marriage was a scandal since both Philip and Bertrada were already married to other people, at least until Queen Bertha died the next year. Bertha was the daughter of Count Floris I of Holland and his wife and she is erroneously referred to as Matilda by Chronologia Johannes de Beke. Bertha had six siblings and both of her parents came from large families and her father ruled a territory vaguely described as Friesland west of the Vlie, which is where Bertha spent her childhood. Count Floris I was assassinated in 1061, and two years her mother remarried to Robert of Flanders, now known as Robert the Frisian, became guardian of Bertha and her six siblings. In 1070, Robert the Frisian became involved in a war with King Philip I of France over succession to the County of Flanders. 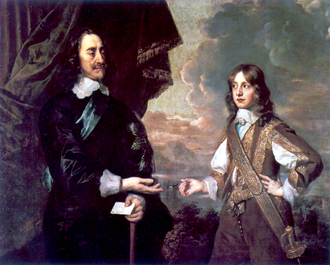 Within two years and Philip concluded a treaty which was to be sealed by a marriage, Roberts own daughters were too young. 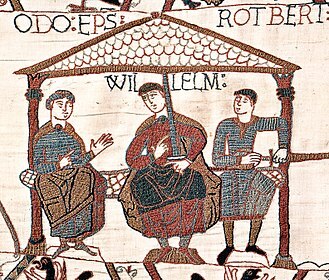 Robert thus agreed to the marriage of his stepdaughter to King Philip, Bertha married Philip, thus becoming queen of the Franks, probably in 1072. Bertha had no kings among her ancestors and lacked even tenuous links with the Carolingian that her predecessors could claim. Consequently, contemporary chroniclers did not even try to present her lineage as more exalted than that of a counts daughter, the shortage of royal candidates made Bertha a suitable choice. Little is known about Berthas queenship and she co-signed only three donation charters. However, she plays a prominent role in the hagiography titled Vita Arnulfi, the hagiography describes how she used her regal power to expel Abbot Gerard of Saint-Médard and reinstate the former abbot, who had been removed due to his mismanagement of the abbey. A bearded Tancred brandishes a sword whilst wearing a turban. Nicolas Poussin's Tancred and Erminia (Hermitage Museum). Constable of France sword, on display at the Musée de l'Armée at Les Invalides, Paris. 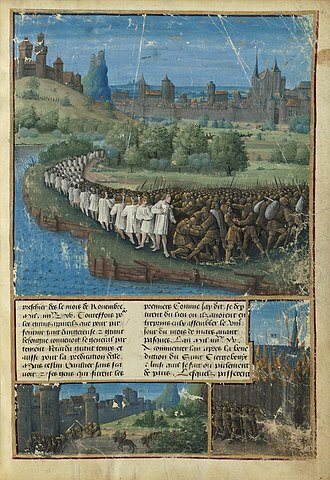 Capture of Antioch by Bohemond of Tarente in June 1098. The Kingdom of France at the time of Hugh Capet. French royal domain in blue.